Cuando éramos chicas, la mayoría jugábamos con una muñeca increíblemente linda, Barbie: Alta, flaquísima, de ojos grandes, labios carnosos y un pelo perfecto. Parecía una princesa y creíamos que cuando fuéramos grandes íbamos a tener algo de ella! When we were Young, mostly of us used to play with a doll incredibly beautiful, named Barbie. She was tall, skinny, with big eyes, full lips and a perfect hair. She looked like a princess and we thought that when we grew up we would have some of it! Pero esto es un cuento de Hadas, y los cuentos de hadas, chicas, no existen! But this is a fairy tale and fairy tales does not exists anymore! Esto solo logro traer pesadillas a las adolescentes que anteriormente jugaban con ella. En pocas palabras muchas tenían el recuerdo de esa figura perfecta, que lamentablemente era inalcanzable. Esas ideologías que nos meten de chiquitas que hay que respetar para ser “lindas”. Una de las tantas que sufrió consecuencias de esta imagen “tipo” que “hay que tener”, fue Galia Slayen, que lucho años para poder recuperarse de su anorexia. La nombro porque fue la primera persona que decidió poner a prueba las medidas ridículas que tenía Barbie. Esta chica armo la muñeca en escala real y esto fue lo que paso… ja! This only managed to bring nightmares to teenagers who previously played with her. Briefly, many of this girls had the memories of that perfect figure, which was unfortunately unattainable. These ideologies they create in our head from childhood that we must respect to be "cute". One of the many girls who suffered consequences of that "must-have or “must be”was Galia Slayen, who fought years to recover from anorexia. 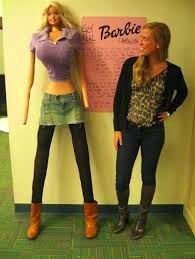 I´ve mentioned her because she was the first person who decided to test this ridiculous measures Barbie had. This girl but the doll into real scale and this is what happened ... ha! Pero bueno, esto no queda acá por suerte! Ahora parece que un artista (Nickolay Lamm) quiere renovar las medidas de la muñeca, lo que sería, las proporciones reales de una persona de 19 años. Por suerte siguen quedando personas con algo de sentido común en este mundo no? But hey, this thankfully not finished yet! Now it seems that an artist (Nickolay Lamm) wants to renew the measures of the wrist, which would be the actual proportions of a person of 19 years. Luckily there are still people with some common sense in this world. Ah! También hay una Barbie en silla de ruedas, lo que me pareció genial. Aunque algunos lo tomaron como una ofensa. Yo lo veo mucho más real y más coherente que la Barbie tipica. Oh! 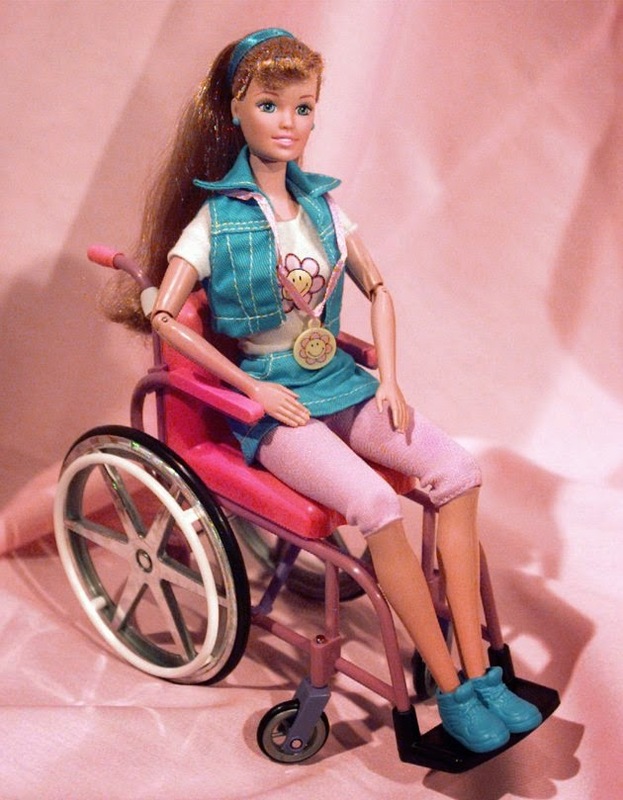 There is also a Barbie in a wheelchair, which I thought was great. While some took it as an offense. I see it much more real and with more sense than the typical Barbie.